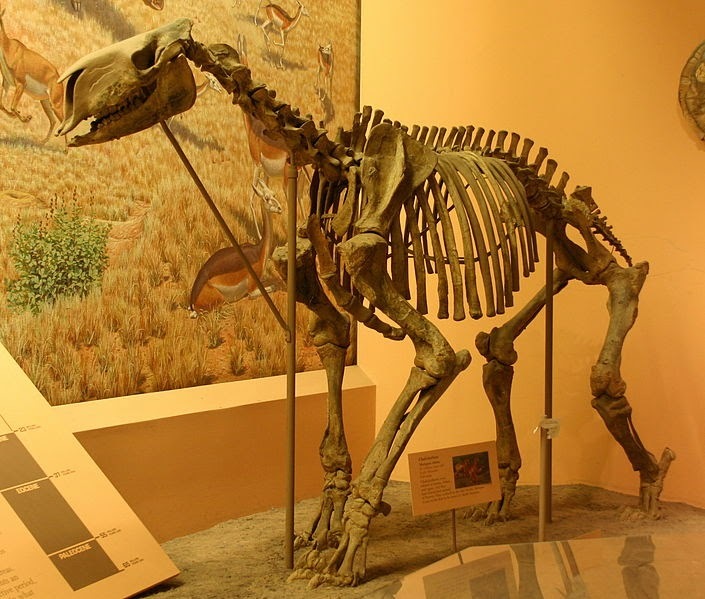 Chalicotheres are an unusual family of perissodactyls* that appeared during the early Eocene of Mongolia. They would have appeared rather different from any animal alive today. Like tapirs they were pure browsers that inhabited lightly wooded and forested environments, like rhinos they had three toes on each foot with the middle toe bearing all the weight, and their faces would have looked somewhat horse-like. These animals are unique among ungulates in that they possess hooves that have become modified into claws. This family survived in Africa until the late Pleistocene when they all became extinct. Chalicotheres appear to have originated in Asia and appear to share a close relationship with brontotheres. The earliest known member of this group, Protomoropus gabuniai, is known from early Eocene (55mya) of Mongolia. The family extended its range to North America by the late Eocene and they reached Africa by the early Miocene. In North America during the late Miocene, chalicotheres had been replaced by the megalonychid ground sloths which had just immigrated from South America. At the same time, chalicotheres in Eurasia and Africa were facing ever-increasing competition from large apes. Africa was the final stronghold for this family. The last chalicothere, Ancylotherium hennigi, survived in here long after its kind had gone extinct elsewhere in the world and it until the very end of the Pleistocene about 13,000ya. Like tapirs, chalicotheres are never abundant in the fossil record and do not show significant variations in their dentition and overall body plan. This suggests that chalicotheres, early on, became specialized for a particular lifestyle (in this case as mid-level browsers) and never deviated from this general morphology throughout their history. Unlike horses and rhinos, they never evolved high-crowned cheek teeth for feeding on more abrasive types of plants found at ground level. Thus, their overall diversity was low and only a handful of species are known to science. This degree of specialization may partly explain the decline and eventual extinction of this family. Because of their extensive adaptations for browsing, the presence of chalicothere bones at a fossil site is a good indicator of an ancient woodland or forest environment. Chalicotheres possessed three toes on each foot, all of which ended in a large claw. These claws grew from and were anchored to deep fissures in the middle of the third phalanges*. This suggests that the claws of these animals were very strong and able to resist heavy impacts and tension. A similar condition can be seen in the claws of creodonts (archaic mammalian predators that preceded the order Carnivora). Like other perissodactyls, most of the animals’ body weight would have been carried on the middle digits of each foot. To deal with this, the bones of the second manual digit are fused to form a structure that strengthens the inside edge of the hand. The Chalicotheriidae is divided into two subfamilies, each characterized by a different type of locomotion. The Schizotheriinae had a more conventional digitigrade* posture in which the animals walked on padded toes like a dog or a cat. This is an efficient form of locomotion that increases the length of the limb to enable a longer stride. To prevent wear and to allow unhindered movement, the tips of the claws were held above the ground when walking or running thanks to tendons in the toes. The chalicotheriinae preserved their claws by walking on their knuckles. For this, the bones of the front knuckles are thickened and well-developed for bearing weight. In the living animal, thickened skin pads would have covered the upper surface of the knuckles to cushion the digits and prevent abrasion. Gorillas, anteaters, and ground sloths have the same adaptation which is designed to protect either their touch-sensitive fingers or pointed claw tips. Chalicothere forelimbs were very muscular and were longer than the hindlimbs, causing the back to slope downward towards the tail. This feature was taken to extreme in the gorilla-like Chalicotherium. These animals would have ran in a moderately quick loping gate. To withstand the weight of the body and facilitate an upright posture, the lumbar region is shortened to increase lower-back strength. The lumbar vertebrae also had elevated dorsal processes that would have supported the tendons and muscles needed to maintain an upright posture for extended periods. Chalicotheres have a number of adaptations that suggest that they were browsing specialists that fed on above-ground vegetation at shoulder level or higher. Adult chalicotheres lacked canines and upper incisors with which to crop vegetation. Instead, they would have possessed a long, prehensile tongue and muscular lips that would pull food into their mouths. They had low-crowned, square-shaped, cheek teeth with which to grind relatively soft leaves and fruits (the name "chalicothere" was coined because the cheek teeth, in their worn state, are said to resemble a chalice or goblet). The skull itself is small but rather long and narrow, an adaptation that enables modern browsers to select individual plants and twigs from among many. Modern browsing mammals often have thick eyelashes which help to protect their eyes during feeding, and chalicotheres likely had this characteristic as well. The necks of schizotheriines were long, narrow, and flexible. Elevated spinous processes on the lumbar vertebrae would have supported strong muscles and tendons that would strengthen the lower back, enabling the animals to stand on its hind legs and hold that position for extended periods of time. These animals were able to browse at many different heights either by feeding quadrupedally as most herbivores do today or by rearing up on their hindlimbs, effectively doubling their vertical reach. The modern Gerenuk (Litocranius walleri) has a similar feeding behavior in which it balances itself on its hindlimbs to feed on high tree foliage. Chalicotheriines had a more specialized feeding method coompared to schizotheres. They had relatively shorter necks and much longer arms, suggesting that they relied more on their forelimbs to gather food and pull it toward their mouths. Inward-facing hands were well-adapted to be used as hooks to either grip tree trunks or to pull branches close to their mouths, similar to the way modern gorillas feed. The short, yet powerful, hindlimbs were well-suited for maintaining a sitting or squatting posture for extended periods of time. Pad-supporting bone on the ischium* acted as a cushion, stabilizing them on their haunches while its torso stood fully vertical. These morphological differences suggest that chalicotheriines would have lived in more thickly forested environments where they could use their unique feeding strategy to full advantage. Schizotheriines were able to live in more open woodland and savanna environments, where their more efficient gait enabled them to travel farther distances to exploit widely dispersed food sources. Furthermore, analysis of chalicothere teeth suggests that schizotheriines were preferentially feeding on more leaves, twigs, and possibly bark, while chalicotheriines were ingesting more seeds and fruits in addition to leaves. Because of the rather long forelimbs, chalicotheres would have needed to crouch down in order to drink so that their faces could reach the water. Because of their body proportions, chalicotheres were relatively slow moving and unable to keep up sustained speeds for extended periods. Despite lacking the necessary speed and agility to outrun predators, or horns with which to fight them off, chalicotheres would have been a formidable target for any would be predator. Their long and sharp claws and powerful forelimbs certainly could have doubled as defensive weapons. Because the short hindlimbs carried most of the animals’ body weight, they would have been able to pivot on their hindlimbs rather quickly. Thus, when attacked from behind a chalicothere would have been able to turn rapidly so that it could face its attacker, brandishing its sharp claws in defense. Like tapirs, it is likely that chalicotheres also had thickened skin on their backs that could deflect the claws and teeth of an attacking predator long enough for the victim to free itself and fight back. It can also be inferred that chalicotheres lived in herds as most herbivores do today. Based on their closest modern relatives, these groupings likely consisted of 3 to 30 individuals and led by an adult male. Younger males would have left their maternal herds at sexual maturity and became part of a bachelor herd until they were old enough to challenge dominant males for breeding rights. Male chalicotheres seem to have had skulls that were somewhat deeper and heavier than those of females, suggesting a fighting style similar to that of the modern Giraffe (Giraffa camelopardalis), whereby two males would stand side-by-side and swing their long necks and heads like wrecking balls until one rival submitted. The genera Tylocephalonyx and Ancylotherium possess a high, thick dome at the back of their skulls that likely evolved for such confrontations, and could have delivered punishing blows to an opponent. 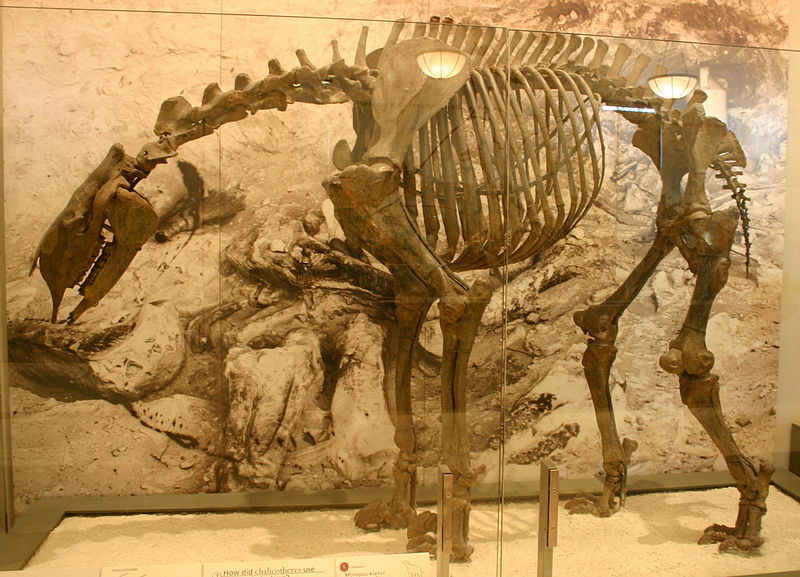 Like all of today's perissodactyls, chalicotheres would have given birth to a single large, fully-developed offspring after a long gestation of 10 months to a year depending on the species. Digitigrade: a type of locomotion in which only the toes touch the ground with each step. Ischium: one of the three pelvic bones; situated below the ilium and behind the pubis. Perissodactyl: the mammalian order which contains horses, rhinos, tapirs, and their extinct relatives. Phalanges: the bones which comprise the fingers and toes.